If you have ever finished a workout only to find that you body is trembling, you are not alone. Involuntary shaking after a workout or trembling after exercise occurs commonly. In most cases, this presents a minor annoyance that passes quickly. Your level of exercise and lifestyle can play a role in the trembling, and in some cases, you may be able to stop the post-workout shakes. Speak to your doctor if the trembling is severe or prolonged or if it occurs outside of exercise. Muscle fatigue provides perhaps the most common reason for shaking after a workout. Your muscles are taxed when you work out and are in a constant state of strengthening. You might feel a tremble when you are done with your exercises because your muscles are not used to the intensity of the workout or are not yet capable of supporting the level of workout you prefer. Resolve this cause of trembling by holding back a bit, exercising at less than 100 percent capacity until your muscles are stronger. Consider reducing the number of reps performed at one time or take longer rest breaks between sets. You might feel shaking or tremor after exercise because your blood sugar has dipped to the low end of the scale. A common reason for low blood sugar after exercising is that you did not eat enough before your workout. Try not to exercise on a completely empty stomach. Instead eat a nutritious snack at least an hour before hitting the pool, track or sports field. A protein-based mini-meal like an energy bar or cheese combined with whole grain toast or cereal gives you the energy boost you need to exercise and keep your blood sugar stabilized. If you are diabetic, consult your doctor to properly regulate your blood sugar during exercise. Trembling or shaking after a workout may be no more than a reaction to the vibrations associated with certain kinds of sports. Cycling and racquet sports are two forms of exercise than can cause shaking in the hands and arms due to the tight grip with which you hold the handlebars or racquet. Riding over bumpy terrain or serving the ball across the court with an abundance of power can cause vibrations that your nerves continue to react to after the fact. These muscle shakes resolve on their own. Tremors that are symptoms of neurological conditions, including Parkinson's disease, may intensify during or after a workout. An intention tremor, also called a kinetic tremor, is a type of trembling that occurs after you have performed any kind of movement. Essential tremors are most common and may happen when you are performing an everyday task like holding a fork or writing as well as after exercising. When your muscles are resting, this type of tremor usually stops. According to MedlinePlus, smoking, consuming caffeine, overall fatigue, stress and emotions such as anger or fear can all make tremors worse. 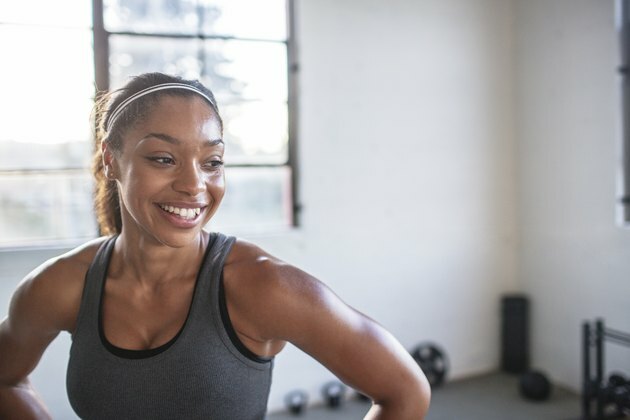 Scientific American: Why Do Muscles Tremble After Strenuous Exercise? What Causes Your Muscles to Shake During Exercise?